“Why do we have wisdom teeth?” “Do they need to be removed?” “When is the best time to have them removed?” As a general dentist, these are among the most common questions asked about third molars or “wisdom teeth” by parents and young adults alike. Wisdom teeth are the third and final set of molars that typically present in the late teens to early 20s. Many misconceptions persist about these teeth and how they are to be treated. 1. They used to serve a very important purpose. Some scientists believe that human ancestors required more grinding functionality of their teeth for proper nutrition because their diet consisted of mostly raw and unprocessed foods. Having these four additional teeth or “third molars” allowed for optimal nourishment. 2. Third molars exhibit more variation than any other tooth in the mouth. Nearly one fifth of the population is missing one or more third molar. In addition, their anatomy is widely variable among patients. Some have one large root and some have tw or three sprawled roots. The age at which third molars emerge into the oral cavity also varies tremendously, with the average being between 17 and 21 years of age. However, it is not uncommon to see third molars erupt earlier or much later than this. 3. Most third molars are recommended for removal. Occasionally, patients have enough space in their mouth for the third molars to grow in and can maintain them throughout their lifetime. However, these teeth are often difficult to access and clean, which leaves them more susceptible to decay or periodontal disease. 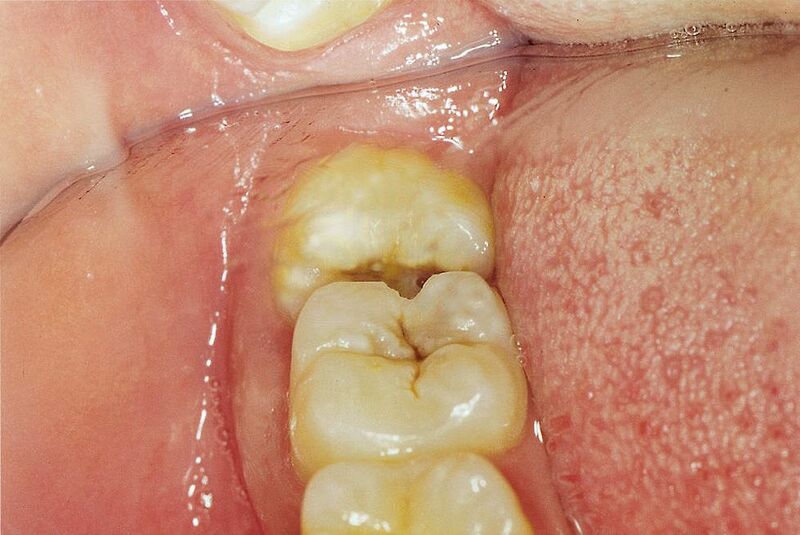 Over time, these conditions could impact the otherwise healthy neighboring second molars. 4. Often they do not erupt in alignment with adjacent teeth. Due to the fact that most patients do not have adequate space in their jaws for complete eruption of the third molars, they can be found in many different orientations. Some are situated horizontally and some angularly. Some are fully covered by bone and/or soft tissues – or “impacted” – and some are just partially covered. Rarely, an impacted third molar may be situated so close to a nerve or sinus cavity that your dentist may opt to monitor rather than remove it. 5. Problems associated with third molars may not cause symptoms. There seems to be a misconception that if the third molars don’t cause discomfort, they don’t need to be evaluated. However, even if they are impacted, or retained within bone and/or soft tissue, problems can arise such as tumor or cyst formation around the tooth. Such problems can cause destruction of bone, healthy teeth, or other tissues, making the treatment more complicated. By frequent monitoring of the development of the third molars, treatment can be more predictable and conservative. 6. Your dentist will evaluate you to create an individualized treatment plan. Your dentist will take into account your age, medical history, orientation of the teeth, and proximity of the teeth to structures such as nerves, sinus cavity, and second molars when determining if and when you are a candidate for third molar removal. Most often, a panoramic radiograph will be taken to visualize the third molars and surrounding structures. 7. Timing is very important. Your dentist will monitor the development of the third molars to determine the ideal time for extraction. The early stage of root development – before these teeth are fully formed – is the optimal time for removal. Once the teeth are ready for removal and it has been determined that removal is the recommended course of action, don’t delay treatment. The healing process is much faster and less eventful in young, healthy patients. Individuals older than 25 may experience a more difficult or prolonged recovery and have an increased risk of complications. 8. Sedation may or may not be right for you. In addition to local anesthetic to prevent pain during the removal procedure, you and your dentist will determine whether any form of sedation is recommended to control anxiety. Sedation options may include nitrous oxide (“laughing gas”), oral sedation, or intravenous sedation. Patients may drive themselves home after the procedure with nitrous oxide but not with any other form of sedation. Many patients undergo third molar removal with some form of sedation, but not everyone is a candidate. Your provider will create an individualized plan to ensure your comfort and safety. Your dentist will be able to answer questions you may have, and let you know what to expect. Our goal is to make you feel as informed and comfortable as possible in order to make each dental experience a positive one.